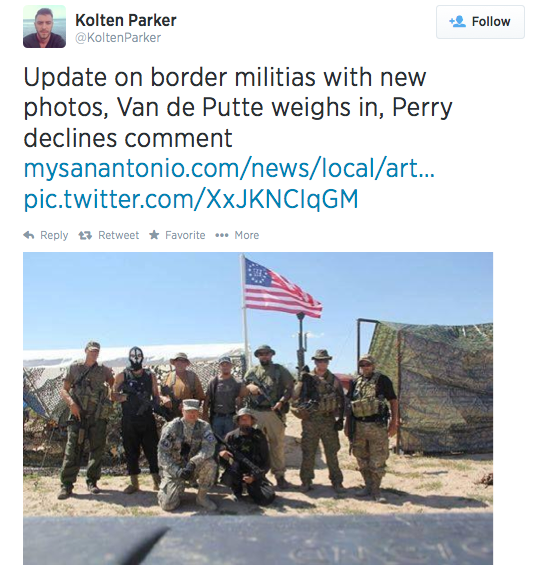 More than 10 militia groups are patrolling the Texas-Mexico border despite objection from the federal government, the San Antonio Express-News reports. The newspaper obtained more than 30 photos showing the armed militia members in camouflage, tactical gear and masks. State lawmakers also expressed concern and anger. “Local law enforcement and federal Border Patrol agents have been clear. The presence of these outside independent militia groups does nothing to secure the border; it only creates an unsafe situation for law enforcement officials that are protecting our communities. Unfortunately, the vile rhetoric of my opponent inspires misguided efforts,” said Van de Putte, who is running against state Sen. Dan Patrick, R-Houston, for lieutenant governor. The groups, including Oathkeepers, Three Percenters and Patriots, have been recruiting members since the media began focusing on an influx of Central American immigrants, mostly families and children. Posted: 7/30/14 at 9:41 AM under News Story.